on snapchat! She says he's her best friend. That's a good thing right? It should be. 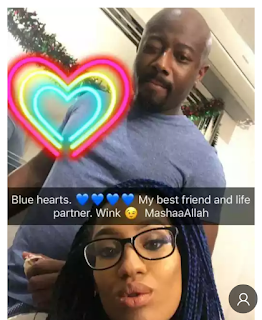 Di'ja's an artist signed to Mavin Records and considering that fact that she described her husband as her bestfriend simply explains how much she cherishes him, it speaks good of her. This is a big step forward and a wonderful lesson to other female artistes as some of aren't married yet and to the married ones here's a message "Cherish your hubbies".